The prominent role large foundations are increasingly playing, along with various high-profile initiatives encouraging giving, have drawn public interest to philanthropy more than ever. This renewed attention has brought with it new responsibilities, just as the public – empowered by the spread of technology and social media tools – grows more inquisitive. Transparency and accountability from governments, companies, NGOs and foundations are no longer options but necessities. The African Grantmakers Network Assembly, held 29 October-2 November in Johannesburg, addressed the global phenomenon with a number of poignant sessions and speeches. When talking about the BRIC nations (which formed the theme of one of the parallel sessions) it’s impossible not to consider the issue of transparency in China or accountability in Brazil, for instance. How accountable can government-organized non-governmental organizations (GONGOs) be? How can accountability be used to deconstruct the public mistrust the sector faces in Brazil? It was pointed out that philanthropy is intrinsically linked to democracy. This suggests that democracies provide a more favourable environment for accountability, but there is still a need for a change in culture in order to nurture an accountable leadership. This cultural change was addressed at a plenary session on the Millennium Development Goals. The panel discussed the connection between accountability and citizenship, and observed that even elected governments may not feel the need to be accountable, especially in cases where large numbers of citizens do not pay taxes. Another issue raised was that citizens’ ability to hold governments accountable may be compromised in some developing countries when aid organizations dominate financing for provision of basic needs. Aid, in this case, could sever a key connection between citizens and their governments. Adding a more practical spin to the discussion, speakers at the ‘Social Accountability in Philanthropy’ session talked about what philanthropy might do to increase accountability between citizens and leaders. According to the panellists, philanthropy’s role is to empower civil society to demand their rights and hold their governments accountable. The effort, however, must go beyond financial support. Foundations need to support capacity building for civil society organizations to monitor and reflect the actual needs of their constituencies. The role of innovative measurement tools and mechanisms, as well as frameworks, was also emphasized; these should be put in place to create an enabling environment for people to make demands. Those measurement tools were the subject of debate at the satellite event hosted by WINGS, ‘Improving the Accountability of International Philanthropy’. During the workshop, 32 participants exchanged ideas on accountability and considered what is needed for it to work in practice. 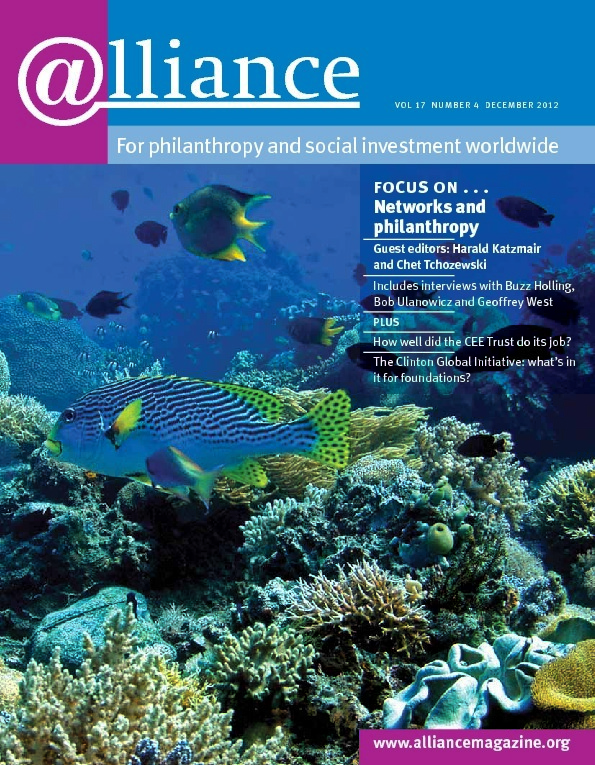 Salient ideas included remedying the lack of a critical analysis of philanthropy from independent actors; the need for accountability to start with organizations in the sector (despite their resistance to self-regulation); accountability as a responsibility and duty to grantees and constituencies; and the uneven playing field with regard to the resources actors have to act upon accountability. The suggestions from workshop participants focused on simple feedback, inclusiveness and capacity-building tools. Suggestions included online libraries with reference materials and how-to guides; online survey tools to collect grantee feedback; best practice sharing; jointly designed and flexible impact assessment tools; and a clear and inclusive grantmaking process. The task may seem herculean, but we mere mortals in international philanthropy can take practical steps now towards greater transparency accountability in our field. Ana Paula Borges Pinho is knowledge management coordinator at WINGS.